OnePlus will start selling its fourth colour option, the OnePlus 6 Red Edition in India starting at 12 PM today. OnePlus will be selling the device on Amazon India and its own portal oneplus.in at a price of Rs 39,999. Notably, the OnePlus 6 Red Edition comes in a single variant with 8GB of RAM and 128GB of internal storage. This is the fourth colour option launched by OnePlus in less than two months. The new Red Edition joins the likes of already available Midnight Black, Mirror Black and Silk White colour variants. Interestingly, the Red Edition launch will be part of Amazon India’s Prime Day Sale which is slated to begin today. 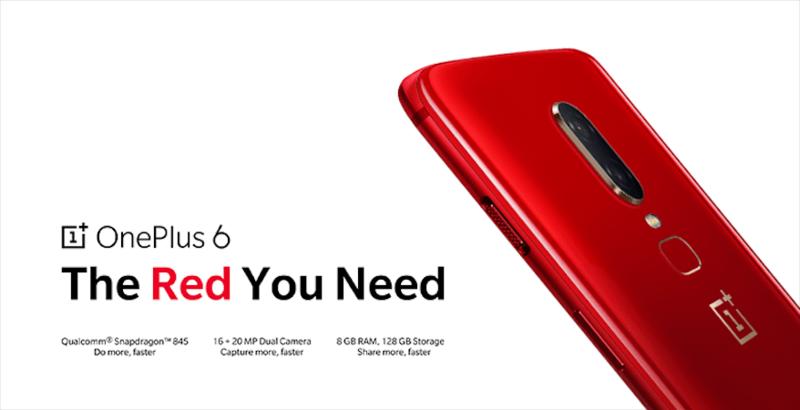 The OnePlus 6 Red Edition boasts of similar specifications as the older OnePlus 6 models. It has a 6.28-inch Full Optic-AMOLED display on the front with a resolution of 1080×2280 pixels and 19:9 aspect ratio. Under the hood, the phone has the Qualcomm Snapdragon 845 chipset, clubbed with 6GB/8GB of RAM and 64GB/128GB/256GB of internal storage. There’s no microSD card slot for storage expansion. The OnePlus 6 is a dual-SIM smartphone with both the SIM slots having support for 4G connectivity. As seen on other OnePlus devices, the OnePlus 6 Red Edition also comes baked with OxygenOS which is built on top of Android 8.1 Oreo. Other connectivity options include Wi-Fi 802.11 b/g/n/ac, Bluetooth 5.0, GPS and a USB Type-C port. This smartphone is backed by a 3300mAh battery with OnePlus Dash Charging technology. Cameras on the OnePlus 6 includes a primary 16MP shooter on the rear, which works in tandem with a 20MP sensor that adds depth effect to the images. On the front, we get a 16MP sensor with f/2.0 aperture. Both the front and rear cameras offer a Portrait mode for images with bokeh effect. The fingerprint scanner on the OnePlus 6 is located on the rear side, and the device boasts of glass back. The OnePlus 6 Red Edition will be available for grabs starting today at 12 PM on Amazon and oneplus.in. This variant comes with 8GB of RAM and 128GB of internal storage, same as the OnePlus 6 Silk White variant and it’s priced at Rs 39,999. Launch offers include flat Rs 2,000 discount on HDFC Credit or Debit cards using EMI option. Why to use Chinese crap OnePlus when world class Asus is there. Asus is that company which once manufactured Apple products as they are known for their best hardware, but because of pressure from Apple, it’s manufacturing unit have to be sold off to other as American’s started using Asus products as they are superior.